All 50 States have “Move Over” laws to protect law enforcement officers and other workers stopped on our nation’s roads. Georgia’s “Move Over” Law helps ensure highway safety for motorists, emergency personnel, active sanitation workers, and utility service workers. when their vehicles are stopped on the side of the roadway. This law was created to reduce the number of injuries and fatalities to police officers, paramedics, firefighters, wrecker operators, and highway construction workers by maintaining an open buffer lane between passing highway traffic and authorized roadside emergency vehicles displaying flashing yellow, amber, white, red, or blue lights. It was amended to include active sanitation workers and utility service workers who are utilizing traffic cones and/or vehicles displaying flashing lights. Move over to the next lane if safely possible. If unable to move over, then slow down below the speed limit and be prepared to stop. This law applies to any emergency, sanitation, or utility service vehicle parked on the shoulder of the roadway. Why was the “Move Over” Law Passed? It saves lives. The “Move Over” Law helps maintain traffic flow and protect the safety of motorists, emergency personnel, active sanitation workers, and utility service workers. Vehicles parked on the side of the roadway are vulnerable to crashes even when emergency lights are flashing. More police officers are killed by traffic crashes than in any other line-of-duty cause of death. More than one fourth of those killed are struck by passing vehicles while they work outside their patrol cars. 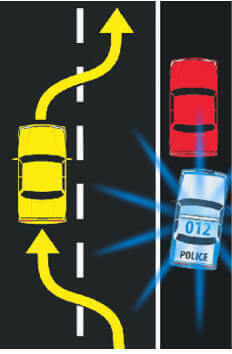 How does the “Move Over” Law make a difference? Thirty percent of all crashes occur as the result of another crash. Providing a buffer lane for these vehicles when parked on the roadway shoulder actually reduces the risk of another crash. When the required clearance is given to these types of vehicles, the margin of safety is increased, not only for public safety, emergency personnel, active sanitation workers, and utility service workers, but for motorists and their passengers as well. Violations can result in a fine of no more than $500 for the first offense. The “Move Over” Law is another reason to slow down on the highways and interstates. Safely change lanes when approaching any emergency, sanitation, or utility service vehicle.